Many jobs created today are environmentally friendly, or “green.” But it’s not always easy to break into these jobs, especially for workers who have spent their careers in unrelated roles. 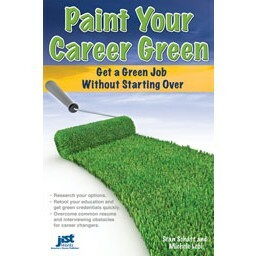 In Paint Your Career Green, Stan Schatt and Michele Lobl describe steps to smooth the way for a career change. “Whether you are looking to shift careers for greater satisfaction, for more money, or to overcome boredom, or if a change of careers is being forced on you, you should know that there is a right and wrong way to change careers,” Schatt and Lobl say. “Find companies in industries that you’d like to work for and research them. Study the company’s website, read up on it elsewhere on the Internet and take a look at its last two annual reports. If you know someone working there, ask for an informational interview. Ask them what it’s like working there, what type of workers they hire…what training you’ll need to do well in the job, what money you can expect to make and what a typical day is like on the job. “Whether you are leaving a job on your own or are being asked to leave, be sure to keep the peace. Within an industry, word gets around, and anything negative you said or did as you left your last job could cost you opportunities down the road.